Home > Special Offers > Sales > Get the 2019 Lexus ES 350 today! Lease the 2019 Lexus ES 350 F Sport starting from $258 bi-weekly at 1.9% for up to 39 months with $6,780 down. Plus get up to $1,000 in delivery credits! 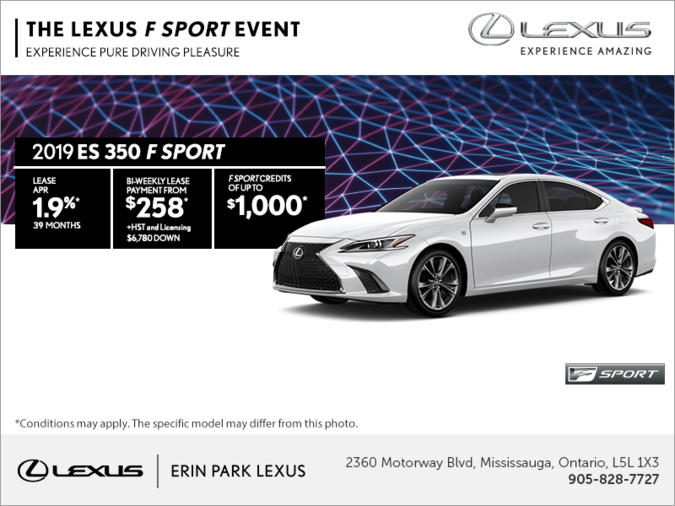 ^F SPORT Credits are available on retail purchase/lease of select new 2019 Lexus vehicles from a Canadian Lexus Dealer and will be applied after taxes have been charged on the full amount of the negotiated price. Vehicle must be purchased/leased, registered and delivered by April 30th, 2019. Lease offers provided through Lexus Financial Services, on approved credit. Representative lease example based on a 2019 RX 350 sfx ‘G’ on a 39 month term at an annual rate of 1.9% and Complete Lexus Price of $66,655. Bi-weekly lease payment is $308 with $8,790 down payment or equivalent trade in, $0 security deposit and first bi-weekly lease payment due at lease inception. Total of 84 bi-weekly lease payments required during the lease term. Total lease obligation is $34,858. 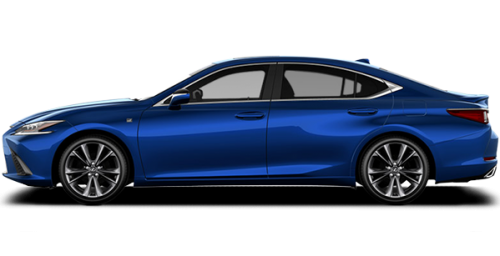 Representative lease example based on a 2019 IS 300 RWD sfx ‘F’ on a 39 month term at an annual rate of 0.9% and Complete Lexus Price of $47,455. Bi-weekly lease payment is $198 with $5,240 down payment or equivalent trade in, $0 security deposit and first bi-weekly lease payment due at lease inception. Total of 84 bi-weekly lease payments required during the lease term. Total lease obligation is $22,009. Representative lease example based on a 2019 NX 300 sfx ‘F’ on a 39 month term at an annual rate of 0.9% and Complete Lexus Price of $53,955. Bi-weekly lease payment is $248 with $6,450 down payment or equivalent trade in, $0 security deposit and first bi-weekly lease payment due at lease inception. Total of 84 bi-weekly lease payments required during the lease term. Total lease obligation is $27,438. *Representative lease example based on a 2019 ES 350 sfx ‘F’ on a 39 month term at an annual rate of 1.9% and Complete Lexus Price of $53,005. Bi-weekly lease payment is $258 with $6,780 down payment or equivalent trade in, $0 security deposit and first bi-weekly lease payment due at lease inception. Total of 84 bi-weekly lease payments required during the lease term. Total lease obligation is $28,605. 52,000 kilometre allowance; charge of $0.20/km for excess kilometres. Complete Lexus Price includes freight/PDI ($2,075), All in Dealer Fees ($399), EHF Tires ($20.70), EHF Filters ($1), A/C charge ($100), and OMVIC Fee ($10). Taxes, license, registration (if applicable), dealer fees (if applicable) and insurance are extra. Lexus Dealers are free to set their own prices. Limited time offers only apply to retail customers at participating Lexus Dealers. Dealer order/trade may be required (but may not be available in certain circumstances). Offers are subject to change or cancellation without notice. Offers are effective beginning April 2nd and expire on April 30th unless extended or revised. See your Lexus Dealer for complete details.